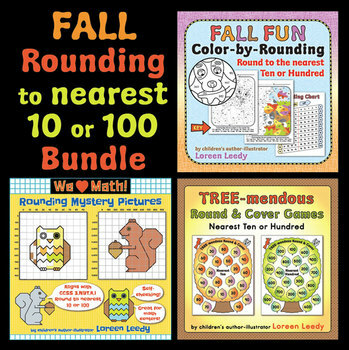 Rounding to the nearest 10 and 100 can be tricky for students so use this discounted bundle with games, puzzles, and color-by-code printable pages for extra practice. Great for math centers or fast finishers! If bought separately these resources would total $9.75. See the great feedback from teachers such as"The graphics really helped my students who struggle with rounding." 2 Mystery Pictures of an owl and a squirrel with clues and answer grids. 2 Round and Cover games with a tree theme in fall colors, spring greens, or black and white with number cards from 1-9, tokens, recording sheets, and helpful Rounding Charts. 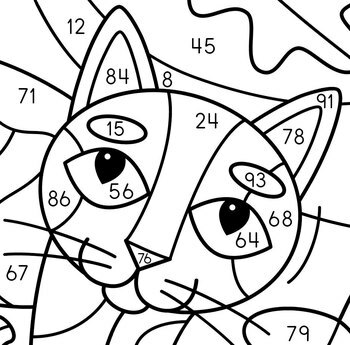 2 Color-by-Rounding pictures of a kitty on a pumpkin and a puppy playing in leaves with recording sheets and Rounding Charts. Check Preview to see pages in each PDF resource. Each activity includes rounding to the nearest 10 and to the nearest 100. To see the individual packets, click Mystery Pictures, Color-by-Rounding, or Rounding Games. Click here to follow my TPT shop. And remember to earn your TPT credits by rating your purchases. Thank you for stopping by!